Named after the founders’ grandfather, who taught them their craft in his sawmill, the “Bud” model is a hybrid cross between an aviator and Clark Kent-style hornrims. Beach season is here and you know that people lounging on the beach will be observing you as you frolic in the sun. 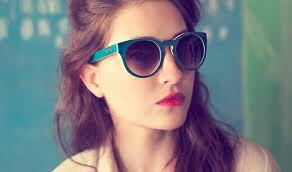 Your sunglasses are an important part of your look, so why not give them something to really stare at? 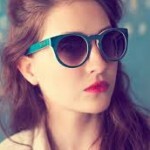 The Bogus frame is a vintage, round, unisex shaped frame that calls for attention. It comes in Red, Blue and Black Bamboo. 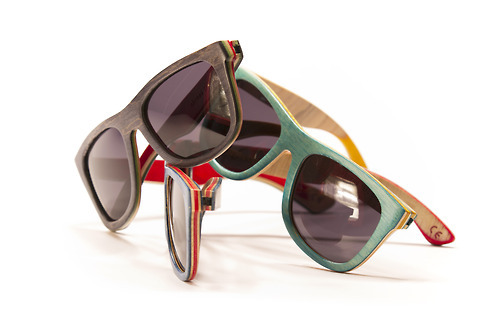 Proof, a company that specializes in handcrafted sunglasses made from wood and eco-friendly plant-based plastic, recently released a new line of sunglasses made from recycled skateboards. Think about it: Skateboards are meant to take a lot of punishment, so the wood – 4 or 5-ply Canadian maple, often covered with an additional layer of exotic wood for looks – is really tough. Skateboards also have their own place in the world of art, so the colors are fun, unique and definitely beach-worthy. The frames are coated with a sweat/water proof wood seal to help withstand the rigors of the beach environment, and they come with a custom wooden case as well as a microfiber pouch for those times when you need less bulky storage. Each frame is laser etched with the company’s logo and a quote inside the temple. What’s even more loveable about these sunglasses is their social impact — not only on the environment, but also on people in need. For every pair sold, Proof donates a portion of the profit to charity organizations, such as a nonprofit organization in India that provides surgery to restore sight to people with cataracts. 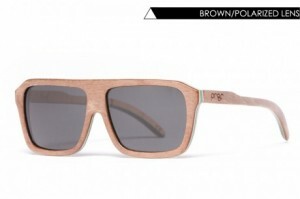 The Bud sunglass is a modern classic shaped frame. The Bud is part of the Skateboard collection which is handcrafted and assembled from 5 ply canadian maple skateboard decks. This unique skateboard construction makes them very durable and one of a kind. Never heard of Proof as a brand? Well, it’s a relatively new company, founded in 2010 by three brothers who grew up working in their grandfather’s sawmill. Obviously, they love wood, and they have that kind of personal pride in the product that only can be found a family-owned business that sells handcrafted items. It’s an all-American success story. They started the company in a garage in Eagle, Idaho and imbued it with their own morals: exquisite craftsmanship, sustainability and giving back to help those in need. It’s heartwarming to see a company with such a moral foundation grow rapidly and reach international renown. Providence Optical is proud to announce the arrival of Proof’s skateboard line of sunglasses – ready-to-wear or prescription. How can you not love them?